Every seven years the first day of summer, my birthday and Father’s Day share June 21. Here in Central Florida it will be a scorcher of a day to welcome summer. It’s also one of those mid-decade birthdays for me, but I’m not saying which, and I’m thinking of ignoring it completely. And it happens to be the fourth Father’s Day since my dad passed away. I’m feeling it–all of it. Dad’s been in my thoughts more than usual for the past several weeks. I’m not sure why. 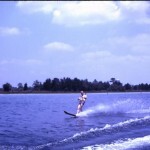 Maybe it’s because I went water skiing with my son, Jonathan, and his daughter, Alex, last weekend. Jonathan looks so much like my dad behind the wheel of the boat. I helped my grand-girl Alex learn to ski. She’s eight, just like I was when my dad taught me how to water ski. I also took a turn on the lake myself after about a five year hiatus. I just kept telling myself that Dad skied until he was in his mid-sixties, and I’m not close to that yet. The exhilaration, freedom, and power of gliding across the water behind a powerful motorboat can’t be matched. I love it, just like my dad always did. 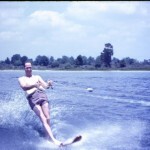 My brother sent these photos of Dad in his prime, ripping up the water at Kingsley Lake near Starke, Florida. Of course, I remember watching scenes like these from the back of the boat during those long beautiful summers of my childhood. I remember being proud that my dad was so strong, so athletic and so capable. But it wasn’t until I became an adult that I appreciated the man he was. My dad, like my father-in-law and so many depression era children, worked hard to give his children a better life. My dad began working at Simmon’s Company, famous bedding manufacturers, when he was seventeen as a factory floor sweeper. When he retired, he was operations manager of one of the company’s largest plants. His hard work planted his family firmly in the middle class suburbs, far from his own rural, back-breaking, tenant farm history. My husband’s father did the same through a career in the Army. Without our dads’ vision and hard work, our own family wouldn’t be enjoying the life they have now. Sadly, I didn’t allow my vision of my father to expand beyond my own childlike needs. Even when I became an adult, he was my dad, my children’s grand-daddy and very important to us. At his memorial service, I realized how important he was to others in his life. In the filled-to-capacity hall, man after man, person after person, stood to share what Cliff Elliott had done to change their lives. The Viet Nam vets my dad hired when no one else would–there were so many at the service that day. The neighbors who relied on my dad for help and advice. The children we played with, now adults, who looked to my dad for an example, the many men and women who’s lives he touched and changed by simply doing his job, being who he was. I realized that Dad was the kind of man who built this country. That his life and work, though seen as ordinary in the social history of this nation, had actually MADE the social history of his nation. Dad’s contributions,when added to the millions of other men like him–like my father-in-law, like your dad, and your grand-dad–brought whole generations from grinding poverty to security. Following their example, my husband has built a life for us beyond the wildest dreams of the early days of our marriage. When he was out of work in the recession of the 1980’s, my husband built a business instead of waiting for someone to give him a job. 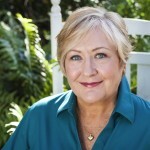 That business that has earned profits for twenty plus years now and operates from two locations that we own. I’m so proud of him and the work he does. Let us show our fathers and husbands how much we love and appreciate them during our private celebrations. Let us be mindful of the foundations they have laid for us with their hard work and example. Let us be thankful that they’ve graced our lives. enjoyed it and the teras did start..
Have a wonderful B-day and see you soon.